Windows Into Learning | The world of 3MT! Over the last three weeks, we have been lucky to work with Yvonne our artist in residence. We have learned so much about artists and their skill in botanical drawings. Artists used to sketch plants in their ‘artists’ diary and often used latin names when labelling their drawings. There was a lot of detail in their books. We also took on the role of the artist. Yvonne brought in seeds, nuts, branches and leaves for us to observe. The magnifying glasses helped us to discover the wonderful detail in the seeds and nuts. We set to work and have begun to put together our own artists’ books. We are looking forward to more fantastic art lessons with Yvonne. We are learning about Melbourne and Aboriginal culture. We travelled to the city by train so we could visit the Koorie Heritage Trust. Len was our presenter and he taught us about many Aboriginal traditions and artefacts. We visited the Flagstaff Gardens because this is where the Aboriginal people used to live before it was settled by the European settlers. It was a special meeting place for the five tribes of Victoria. They used to fish in the Yarra River and trade up on top of the hill with other clans. In Victoria, the early Aboriginal people had to keep warm with their possum cloak. In summer, the fur would be worn on the outside to keep them cool. They had a special relationship with the land and used only what they needed. There were many traditions that were passed on from generation to generation through stories. Birrarung Marr was a great place to visit too. We listened to Dreaming stories, sketched, played, reflected and observed the beautiful patterns and designs of the special artwork. It was a fantastic day! On Friday the 14th of March Mr Cleary, Mr Kelly and 22 boys from Marcellin College came to our school. The boys spoke to us about nutrients and the need to drink water especially when we do sport. We learnt about the type of food we should eat. Foods that are good for us are foods with protein and carbohydrates such as egg, meat, pasta and wholemeal bread. We should eat lots of fruit and vegetables. We did six activities. They were Scarecrow Tiggy/Back to the Nest, Mini Soccer, Poison Ball/Rush Ball, Continuous Cricket, Octopus and Footy. We had a really fun morning and we thank Mr Cleary, Mr Kelly and the boys from Marcellin College for organising the activities and giving the talk about nutrients. Have a look what we got up to. Yesterday we made pancakes with Mrs. Mosbauer. It was Shrove Tuesday and here are some of our reflections. What do you like about making pancakes? On Friday we learned how to play the Trading Game. It is a game where we can build and rename numbers using MAB material. Every time you roll the dice, you add that number of ones to the last column. When you have ten ones you trade it for a ten (one long). These are some important things we needed to know. Once we had 10 ones, we could trade them for a ten (long). When we had 10 tens then we could trade them for a hundred(Flat). Once you have 10 hundreds, we could trade them for a thousand (cube). We are going to play this game again this coming week and maybe we can trade some hundreds for thousands. Here we are in action. We would like you to meet the new Kids Matter Reps for our class. 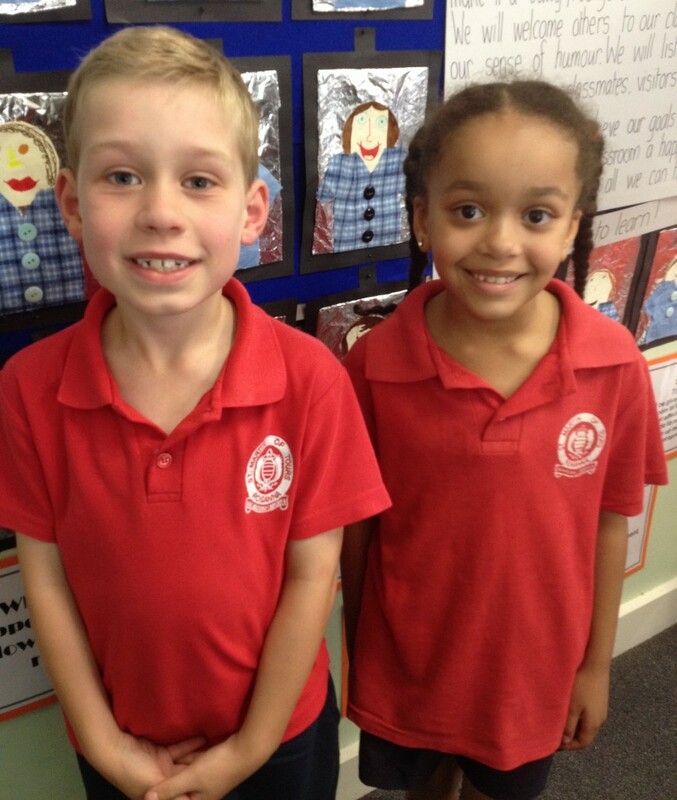 Xavier and Celine were voted in this week. Celine is the Semester One rep and Xavier has offered to be the Semester Two rep. They have offered to give up part of their recess break to attend meetings and be our representatives. We know they will do a great job! This week we have been working on writing good blog comments. As the new school year has begun, we have a new class blog and we would like to leave quality comments not only on our blog but on other blogs we like. We watched a video from a post from Mrs. Yollis with her students describing “How To Compose A Quality Comment’. We picked up some really important information which we have described in our Slideshare. We also practised writing quality blog comments. Lots of people in our class wanted to write to Miss Y. She has taken a ‘gap’ year and we liked the comment she left for us on our blog. You might like to read some of our comments. What do you think of our comments? We have had a very busy first week at school. We have made some new friends and we know so much more about them. 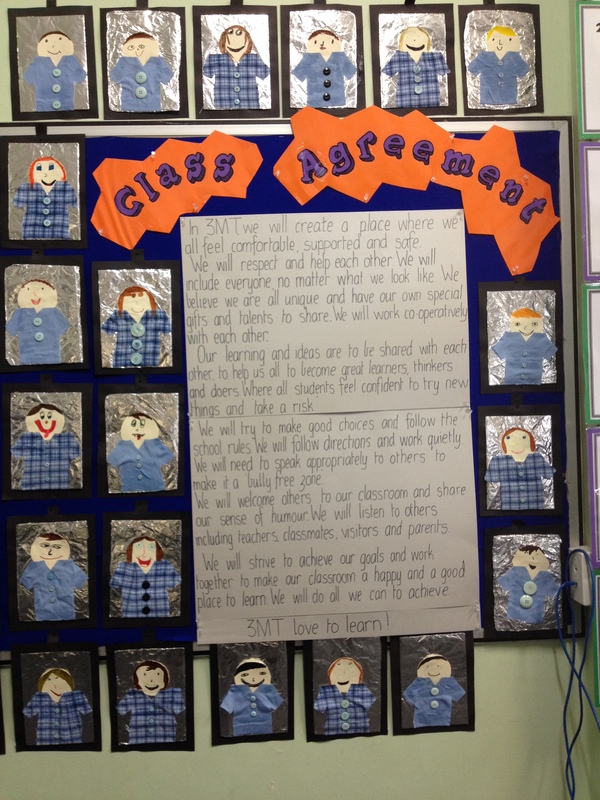 Everyone in our class helped to write up our Class Agreement. There are some very important ideas. We also loved making the artwork to decorate it. Maths time was also special because Mrs. Mosbauer taught us a game called “3×3” where we needed to find the ten’s facts. By Friday we were already getting much faster. Our Immersion box activity really got us thinking. We tried to think about the items in the box. and how they were connected. Ms.Tieppo was very impressed with our thinking. What was the best thing about this week? What are you looking forward to next week? This week 3MT worked together to come up with our own class agreement. We worked in groups to think about what our class would look and feel like. Mrs. Mosbauer asked us to think about the things that we would be proud of in 3MT. What do you like about our class agreement?